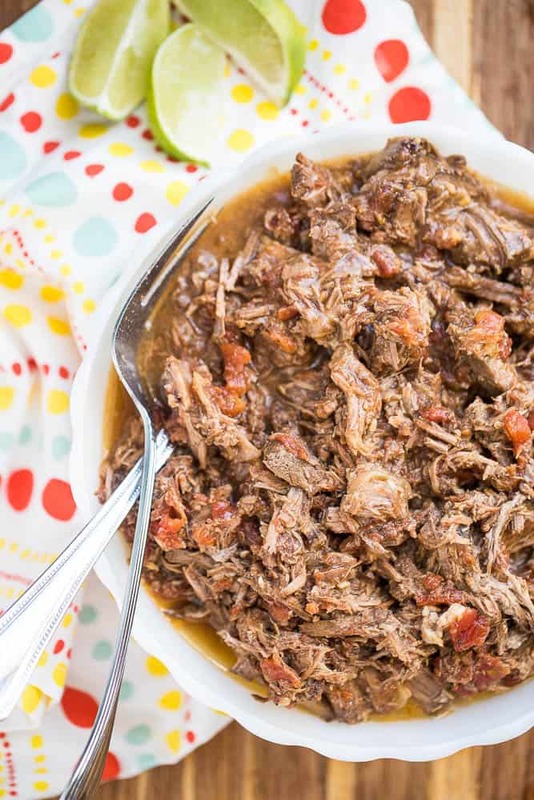 This Slow Cooker Chipotle Shredded Beef recipe has been updated, re-photographed, and Instant Pot adaptation has been added to the recipe! This recipe was posted on my blog almost exactly a year ago, but I decided to bring it back up to the front because a) I have a photo of it now and b) this beef is seriously so good. I made a huge (triple) batch of it Valentine’s Day weekend because had a lot of family in town for my daughter’s baby blessing. I think that having too much food leftover is much better than running out during dinner, but that means I usually have lots of food leftover. The last time I made this we used the leftovers in some nachos and it was fantastic. This time I tried to get more creative and I made a soup out of some of the leftover beef. Whoa. That turned out so well that it gets its own post shortly. We don’t usually eat a lot of red meat, but I could seriously eat this stuff daily. Especially since it gets better after a day or two. 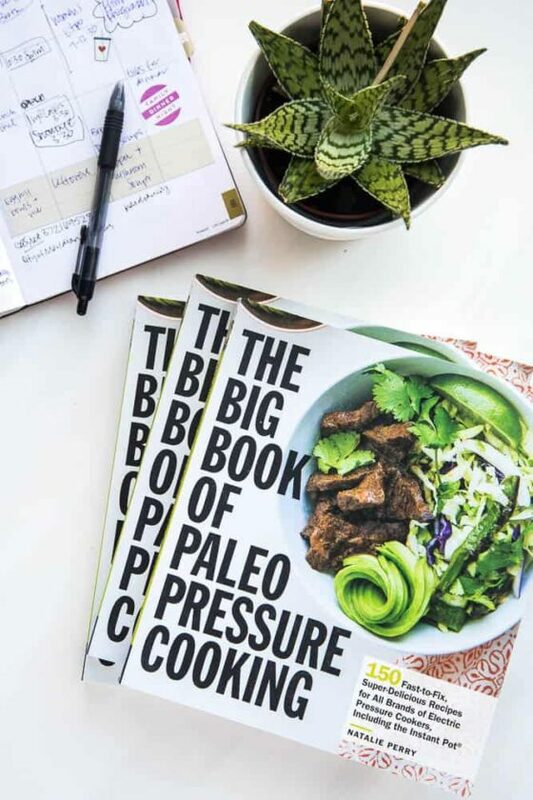 I love batch cooking in my slow cooker or Instant Pot so much that I added a few dozen pulled pork, chicken, and beef recipes to my cookbooks — The Big Book of Paleo Slow Cooking and The Big Book of Paleo Pressure Cooking (Instant Pot!). So many great ones in there — I think the Peperoncini Beef is my all-time favorite though. I do have more shredded meat recipes on my site, though! 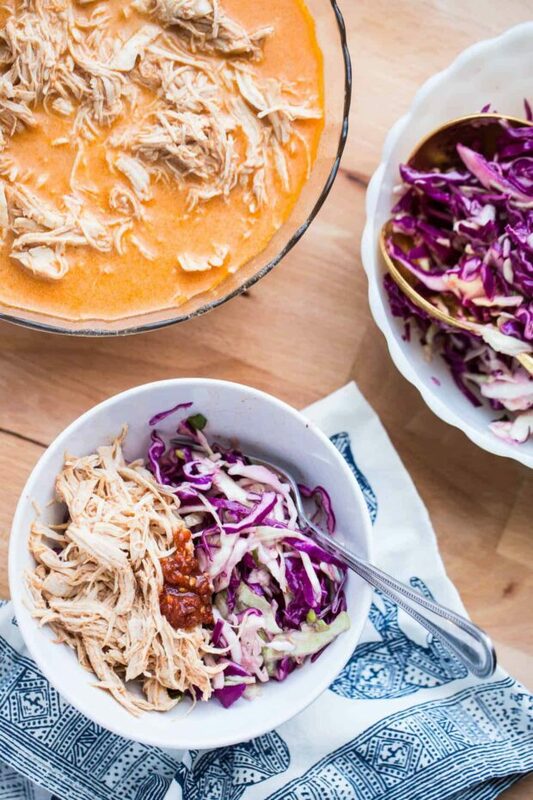 Shredded Red Curry Chicken & Sweet Thai Slaw went over REALLY well with my kids. Super quick in the Instant Pot, too. Slow Cooker Green Chile Chicken is a super versatile recipe you can use in all kinds of Mexican-inspired recipes. 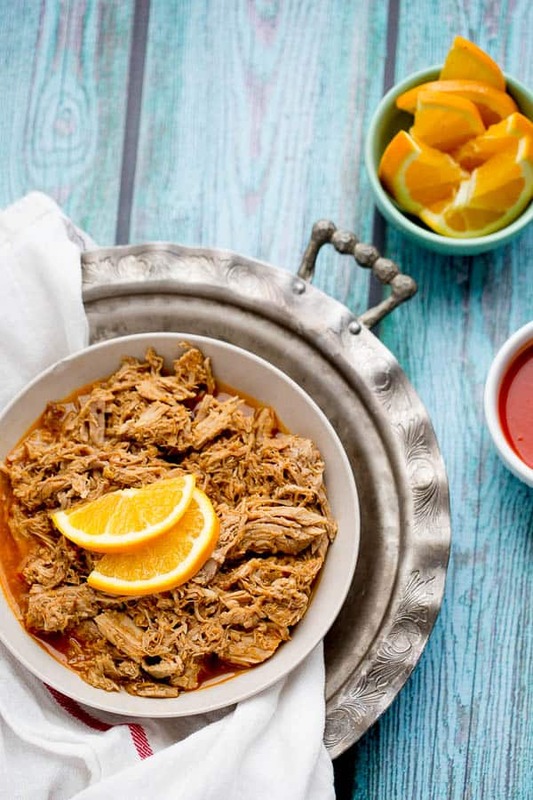 Hot & Sweet Orange Pulled Pork. Think…. wing sauce meets citrusy sweetness. It’ll blow your mind. 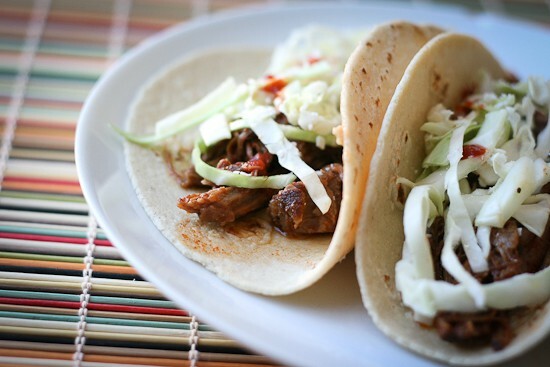 If you’ve got some extra time on your hands, try this authentic Taqueria-Style Shredded Beef. That kind of drippy, spiced beef you get in those tacos from the hole-in-the-wall places. Mmmm. 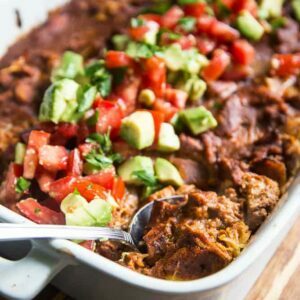 Here’s another version of a tex-mex slow cooked shredded beef: Chipotle Barbacoa Recipe — a knock off of the restaurant version over at Wholesome Yum! 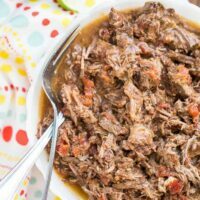 Make this chipotle shredded beef in your slow cooker or Instant Pot! 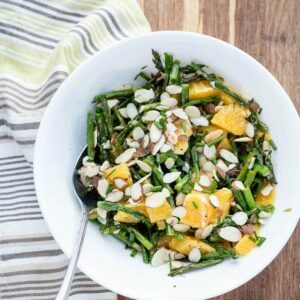 It's a perfect meal prep recipe to give you a head start on weeknight dinners. Trim meat of fat and strange gummy parts and cut into about 6 pieces. Rub the roast with the salt. Place meat in a 4 or 6 qt slow cooker. Add undrained tomatoes, onion, chipotle peppers, oregano, cumin and garlic over the roast. Cover and cook on low heat for 8-9 hours. Remove meat from slow cooker, shred with a couple of forks and return to pot. Cook for an additional 20 minutes or so until heated through and flavor from the juices has incorporated into the meat. Add cilantro and lime juice. 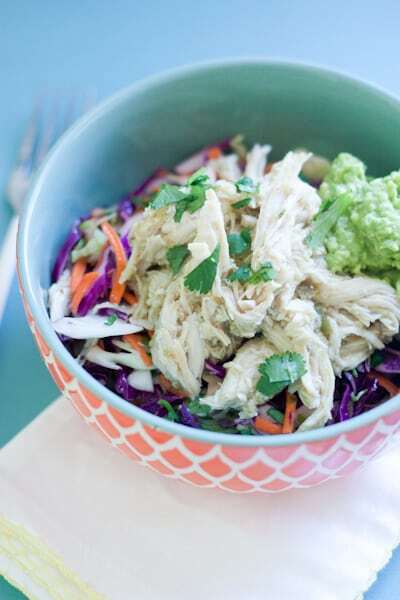 Serve on a tortilla/lettuce wrap or over a bowl of veggie noodles, rice, or cauli rice. Why, yes. A cow WILL fit into the back of a minivan. Hey, you linked to our food blog! Snaps to you, friend/cousin! I guess I should at least acknowledge that I read the recipe, too. Mmm. Thanks Jenn! I’m glad that you said so because then it doesn’t look like I was exaggerating :) Glad you liked it!! I’ve got this recipe (and the steak and potato soup for leftovers) on my weekly menu. I am excited to make it. I also had to tell you I love the new header! I made this today with cilantro lime rice (like at the restaurant Chipotle) and it was so good. 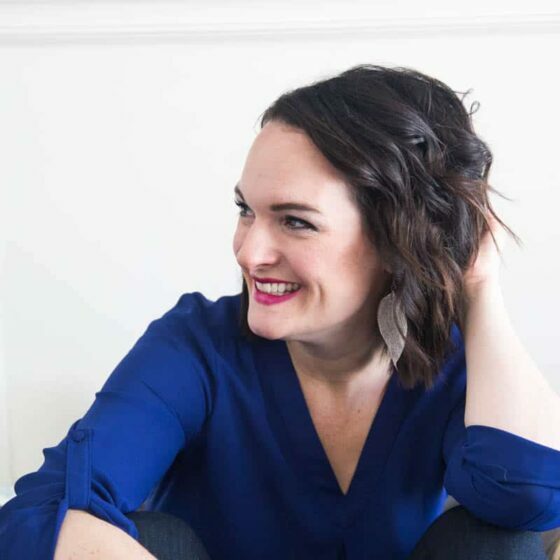 I’ve been wanting to try this forever (it’s been sitting in a One Note file for a long time…oh, how I love One Note….another reason to thank you). Anyway, and I am in the middle of eating this for dinner right now. I had one burrito, was waiting to see if I really wanted/needed more, and have decided that I just can’t stop at one (the need part is still questionable, but whatever). Kurtis and I both love this. It’s delicious. I actually wish we had invited someone over for dinner. 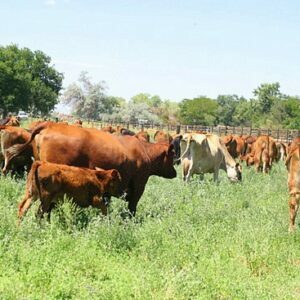 (Especially since my grandparents gave us a giant roast because they’re about to get the meat from their new cow and they still had some from the old cow in the freezer. And when I say giant, I mean giant. It was like 4.5 lbs. I’m hoping this freezes well.) We have the soup on the menu this week as well. I probably should just leave a comment right now for that letting you know that it is amazing because I have no doubt that we’ll both feel that way…we always do! I love that you posted this recipe. This was one of the first things I made out of the better homes and gardens cook book I got for my wedding (almost ten years ago). I didn’t know anything about anything and put in a WHOLE can of Chipotle Peppers in Adobo sauce. As we were eating it I thought “who in the world can tolerate something this spicy!!! !” ha ha. I later made it with some jalepenos from a jar and liquid smoke (I figured that those peppers were just smoked jalepenos, right), and it became one of our favorite meals. Making it again today with just one pepper from the jar :). Hey, those weekly menu things that you have are pretty great, more please! Oooh, I’m making this now! :) I’m using chicken instead of beef, though.